They’re really much bigger than that. Luckily for our paleontologists, I’m just kidding – this is not a creature you would ever want to run into alive. They were the top predator of their time, about the size of a Bengal tiger when they were full-grown – and just as mean. On the other hand, they lived about 290 million years ago, and show evidence of being early ancestors of mammals – like you and me. So it might have been pretty cool to see one alive – at least for the few seconds you had left. 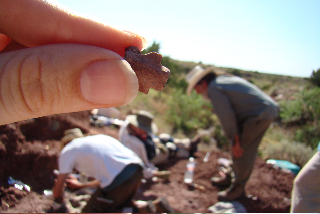 Led by Dr. Bakker, the paleontology team has been searching for Dimetrodon in North Texas for over two years now – and they’ve made some fascinating finds. For the last week, they’ve been running their annual Paleontology Field School for educators. 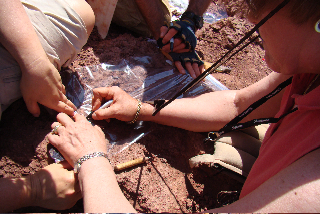 During this program, science teachers learn to dig for fossils, and then take what they’ve learned about geology, paleontology, biology, anatomy and more back to their students. is working on in the background. 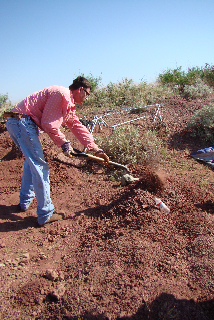 More than just digging up bones, the team is working to unravel the entire ecosystem of the Permian period, as expressed in the Red Beds of North Texas – the best beds for fossils of this era, in the world. It’s extremely slow work – once a fossil has been found, no matter how tiny (and some are almost ridiculously miniscule), it must be logged, mapped into place (this information is used for futher study, back in the lab), and then removed for preservation. Significant, larger finds are jacketed first, with plaster, to be excavated further back the museum in Houston or in the Paleo Prep Lab at The Woodlands Xploration Station. scanned into the computer for analysis. Once they are digitized, the maps will help reconstruct the death events that took place – was this fossil a part of one individual – or another entirely? Was this Dimetrodon tooth shed in the act of eating a Xenacanth shark? 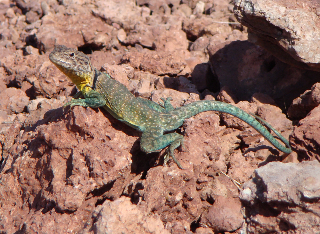 – which will contribute to a better understanding of how these animals related to one another. 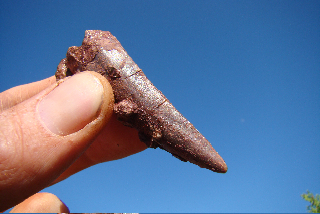 This is a great find – a huge Dimetrodon fang, one of the largest Dr. Bakker has ever seen. This photo shows what a fossil from this area looks like when you uncover it; now, it must be mapped in place before being removed from the site and packaged up and stabilized for the trip back to Houston. 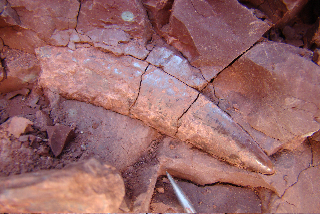 Once it has been excavated, you can see the same fossil fang a bit more clearly. If you look closely, you can see that the serrated edge of the tooth is preserved and still visible – almost 300 million years after this Dimetrodon died. comical until you realize how hard they bite. 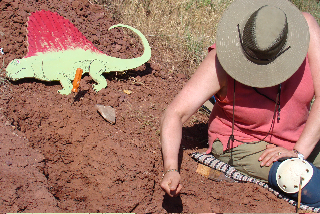 They’re still working out at the site; over the weekend, they discovered a new Dimetrodon skull, a fully articulated Diadectes hand (which is rare, because hands and feet are normally the first part of the body to be eaten or wash away) and a Dimetrodon scapula and humerus in perfect condition, and still attached. We hope to have photos for you soon. In the meantime, a new group of teachers joins the team today – who knows what is yet to be discovered?